StoreFinancial and CDC will provide a link, maintained and updated by StoreFinancial, which will cover general information common to the program. How can a customer find the available balance on the gift card? What if the gift card is declined? How are returns, exchanges, or disputes handled? Can the cardholder re-load the gift card by putting more money on it? What if the gift card is physically damaged? Who should a customer contact if the gift card status reads, “inactive,” when funds should be available? Can the gift card be used at an ATM, “Pay at the Pump Gasoline,” or gratuities? Can the gift card be personalized or embossed with the recipient’s name? Can the gift card be used online, for mail orders, or phone order purchases? Can balances from multiple gift cards be combined on to one gift card? What should a customer do with the gift card once the funds are depleted? · Who is StoreFinancial? StoreFinancial is an international payment systems processor based in Overland Park, Kansas (a suburb of Kansas City, Missouri) that offers the most comprehensive turn-key shopping center gift card program in the world. · How can a customer find the available balance on the gift card? The value of the gift card will be written on the back of the gift card and may be listed with the materials that came with the gift card at the time of purchase. Other options include calling the number on the back of the gift card, check www.getmybalance.com, or visit the CDC Office during normal business hours. · What if the gift card is declined? If a transaction is declined, the customer should check the balance (see, “How can a customer find the available balance on the gift card?”), tell the cashier know how much is available on the gift card to use towards the purchase, and pay the remainder with another form of payment. · How are returns, exchanges, or disputes handled? Merchants may credit gift cards, subject to their return policy, back to the gift card used to make the original purchase. For this reason, it is very important that customers keep gift cards and receipts. Funds credited by the merchant will be available 3-5 days after the return is processed. If the gift card is not present, the merchant may issue a store credit, store valued gift card or exchange. Please note that voided transactions may take up to 7 days to be credited back to the gift card’s available balance. · Can the cardholder re-load the gift card by putting more money on it? No, the gift card is not re-loadable. However, returns and credits can be applied. · What if the gift card is physically damaged? Contact the CDC office or call the number on the back of the gift card. · Who should a customer contact if the gift card status reads, “inactive,” when funds should be available? Please contact the CDC office or call the number on the back of the gift card for more information. · Can other forms of payment be used with the gift card when making a purchase? Yes. The customer should inform the cashier how much to deduct from the gift card and how much to deduct from the other payment method(s). Please note that some stores are not able to split purchases between gift cards and credit or debit cards. In these cases, a customer may need to pay the difference in cash or check. · Can the gift card be used at an ATM, “Pay at the Pump Gasoline,” or gratuities? No. The gift card cannot be used at ATMs, Pay at Pump Gasoline, or for tips or gratuities. · Can the gift card be personalized or embossed with the recipient’s name? No. One of the safety features of the gift card is its consistent appearance. At this time, gift cards cannot be personalized or embossed with any recipient’s name. · Can the gift card be used online, for mail orders, or phone order purchases? No. The gift card will decline if these types of purchases are attempted. · Can balances from multiple gift cards be combined on to one gift card? Yes. Contact the CDC office or call the number on the back of the gift card for more information. · What should a customer do with the gift card once the funds are depleted? Keep the gift card, even after the balance is depleted, in case items need to be returned. A merchant might ask a customer to present the gift card as proof of purchase. 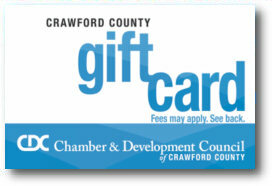 · For all other questions regarding the gift card, please contact the CDC office or email clientsupportsupervisors@storefinancial.com. Please be sure to provide the sixteen (16) digit card number.